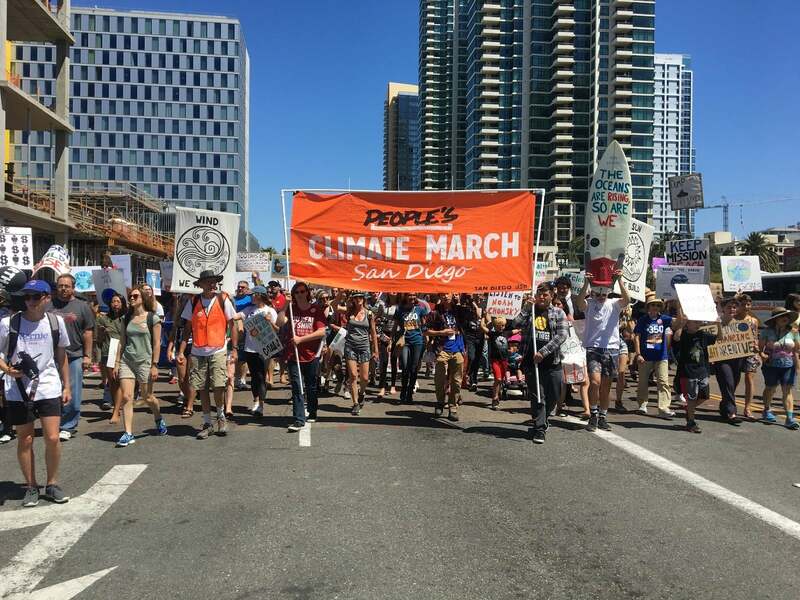 Thousands of activists marched the streets of Downtown San Diego for The People’s Climate March on April 29 to raise awareness about both the planetary and political factors causing Earth’s warming climate. The demonstration featured speeches from former teachers, locals, Assemblywoman Lorena Gonzalez Fletcher and UC San Diego student Mukta Kelkar. The San Diego People’s Climate March was one of 300 marches across the nation including The People’s Climate March in Washington D.C., and the goal was to call on leaders to use clean energy sources and put a halt on climate change policies that are being implemented by the current administration. The march started with live music, informational booths, fun activities, a kid’s zone with games and speeches at Waterfront Park. People were socializing and were even sharing the posters and flyers they made at home to use during the march. Kelkar told the UCSD Guardian why climate issues matter to our generation and are urgent while being able to inform people how they can make a difference. Hector, a protester who requested to keep his last name anonymous, mentioned that it is important to attend these marches and show the government our disapproval of their actions. Bryant Jew, a marine biology major at UCSD, talked about why it is essential to act and how he hoped to see more involvement from students and collaboration with other colleges.